Some of the GOT cast have films that are more well-known than others. Gwendoline Christie, who shines as Brienne Of Tarth in Westeros, was in two huge blockbusters this past year. And let's not forget Sophie Turner in X-Men. If you miss these familiar faces from the Game Of Thrones cast, why not watch some of their other recent work before the series comes back in April? The wonderful Brienne of Tarth had a banner year. She was in not one but two huge blockbusters in 2015: The Hunger Games: Mockingjay Part 2 (GOT co-star Natalie Dormer was in this film as well), and Star Wars: The Force Awakens, playing Captain Phasma (though sadly, we never get to see her face). In an interview with Variety about her involvement in three hugely-popular and beloved franchises, Christie said: "It’s great to be involved in three big franchises, but [they’re] big three big franchises that are looking to expand our consciousness about each other as human beings, and that’s very exciting," going on to say that she felt that, though Star Wars, The Hunger Games and Game Of Thrones are very different in plot, they're all progressive stories, which Christie loves. Khaleesi took a break from fantasy to star in the sci-fi staple Terminator Genisys, playing the role of the incredible Sarah Connor, who was previously played by Linda Hamilton in Terminator, Terminator 2: Judgement Day, and Terminator Salvation. Besides her introduction to the franchise, Clarke also starred in two films that will be coming out this year: Me Before You and Voice From The Stone. Both, in fact, are based on novels of the same name by Jojo Meyes and Silvio Raffo, respectively. Maybe the best evidence of Jon Snow not really being dead is that Kit Harington hadn't booked a slew of projects post-stabbing. He did star in an installment of the British spy series Spooks, a name only Brits can take seriously. 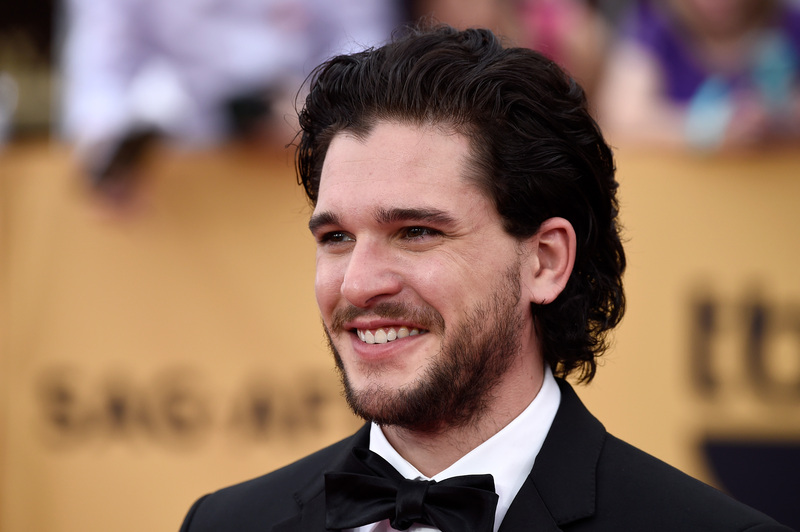 Harington played Will Holloway, who's enlisted by MI-5. And there will be more Harington at the movies this year. He stars in Brimstone, which, fantastically, also stars Carice Van Houten aka Melisandre on GOT. Brimstone is a western thriller and has an all-star cast that includes Dakota Fanning and Guy Pearce. But my favorite non-Jon Snow work of Harington's? 7 Days In Hell, the absurd satiric tennis comedy he made with Andy Samberg for HBO. If you have HBO Go, watch it now. Peter Dinklage had perhaps the weirdest interim projects of the Game Of Thrones cast, but, hey, playing Tyrion must really tire him out emotionally, He's entitled to some fun. Dinklage played a role as a vengeful gamer in Pixels, which also starred Adam Sandler, and he seemed like he was having a very good time. In addition, he's doing the voice of The Mighty Eagle for The Angry Birds Movie, and a movie that everyone over the age of 12 should be excited about: Melissa McCarthy's The Boss. McCarthy will play a "capitalist televangelist" who goes to jail for insider trading, and then makes it her mission to rebrand and restore her image. Dinklage's role hasn't been revealed yet, but I can't wait to see him with McCarthy as his comedic partner. Turner, who is only 19, already has a huge role in the X-Men franchise: she plays a young Jean Grey in the upcoming X-Men: Apocalypse. That's big enough in itself. Dormer reprised her role as Cressida in the final Hunger Games: Mockingjay, Part 2 , in which she was unambiguously amazing. However, she's also the star of The Forest, which raised criticism: the film about the real Japanese Suicide Forest has been slammed for being culturally insensitive. Headey didn't have much time to make a ton of movies in 2015, because she was having a baby. She's gonna make it up to her fans, though: Headey stars in Pride And Prejudice And Zombies, the ghoulish Victorian zombie take on Jane Austen's classic period piece. She'll play Lady Catherine De Bourgh, the obnoxious aunt to Mr. Darcy. Delightfully, Charles Dance, aka Tywin Lannister, plays Mr. Bennet in the film. Want more Melisandre? Look, me too. It's likely that the Red Woman will play a huge role in season 6 of GOT, but, even so, you can go to the movies to catch her in I Feel Fine, a dark picture about drug addiction set in Glasgow which also stars the wonderful David Tennant, and Brimstone, with Kit Harington. Her most controversial upcoming role is in Race, playing infamous German director Leni Riefenstahl, who filmed for Hitler The Triumph Of The Will. The film centers on Jesse Owens at the 1936 Olympics, which Riefenstahl filmed. Stephan James plays Jesse Owens. Williams is one of the hardest working actors on Game Of Thrones, and, off the set, she just keeps the hits coming. In 2015, Williams hopped from the set of Game Of Thrones to the set of the legendary British series Doctor Who for Season 9, but I'm most excited for her forthcoming film The Devil And The Deep Blue Sea, in which Williams stars as a homeless teen opposite Jason Sudeiis, an architect who helps her build a raft to float across the Atlantic. And Justin Timberlake is doing the music! So, in the months between now and Season 6 of Game Of Thrones, if you can't stand to watch your favorite cast members suffer in Westeros, catch them in any one of these other films — where things don't always end in misery. Images: Disney; Paramount Pictures; John P. Fleenor/HBO; 20th Century Fox; Lionsgate.